Instead of a nail art without dimension, this workshop will teach you how to create stiletto nails with 3-dimensional flowers. Stiletto nails are tight and narrow; therefore the tip of the nail looks pointed. It requires expertise from a professional educator as the process is slightly challenging. To enhance on the uniqueness of the nail, 3D flowers will be added to the stiletto nails as well. 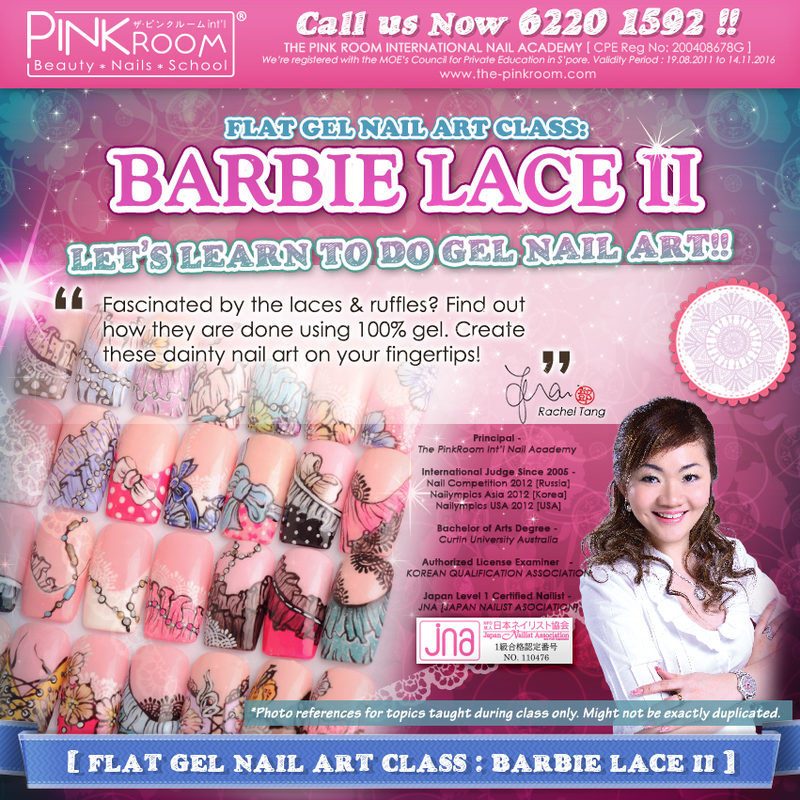 Students will get to learn two techniques in this workshop; making of 3D ribbons and hand painting of nail art design using Acrylic. Our professional educators will guide the students using the step by step basis to create the 3D ribbons and tips on how to draw the outlines of professional looking Plaids and Checkered design. This design will stay trendy for festive seasons, such as Christmas. Folk art is an unique blend of colors followed by painting of traditional folk art flowers using vibrant colors. Though the creation of such folk art designs seem like it require complicated procedure, but all you require is just a brush, a pot of gel and of course with guidance of our qualified educators. In addition, students will be able to learn how to blend different types of colors. The end product will look similar to a 3D effect. PANTONE is the rising trend for the upcoming season! Pantone is a mixture of shades with transcedent blue and pink! Here’s a sneak peek of our Pantone Knitted Nail Art. This nail art is paired with the detailed knitted design, doesn’t it looks subtly eyecatching? To cope with the recent rainy weather, pamper your nails with a set of knitted outerwear maybe? Pastel & Cream Knitted Nail Art. Add an artistic personality to your nails by using some typewriting wordings! Knitted design along with splashes of neon paints, this will definitely be very suitable for the upcoming summer season! Interested to join us for our workshops? Contact 6220 1592 to find out more! One of the most popular workshop we have held sometime ago was this Bubble In The Nail workshop. We received very good feedbacks and comments on this workshop. Many of our students has successfully created their very own nail design using the techniques taught in class by our professional educators. In this post, we would like to feature some of our memorable nailart workshops we have conducted in the past. This workshop is guided by our educator, Master Joe! If you are interested to know more about him, you can read about his most recent achievement here. Take a lookmat this interesting design, we have seen such designs on mobile phone covers, etc BUT on your nails? This is definitely eye-catching right?! Step up your nail art game with this gelly tole painting techniques. 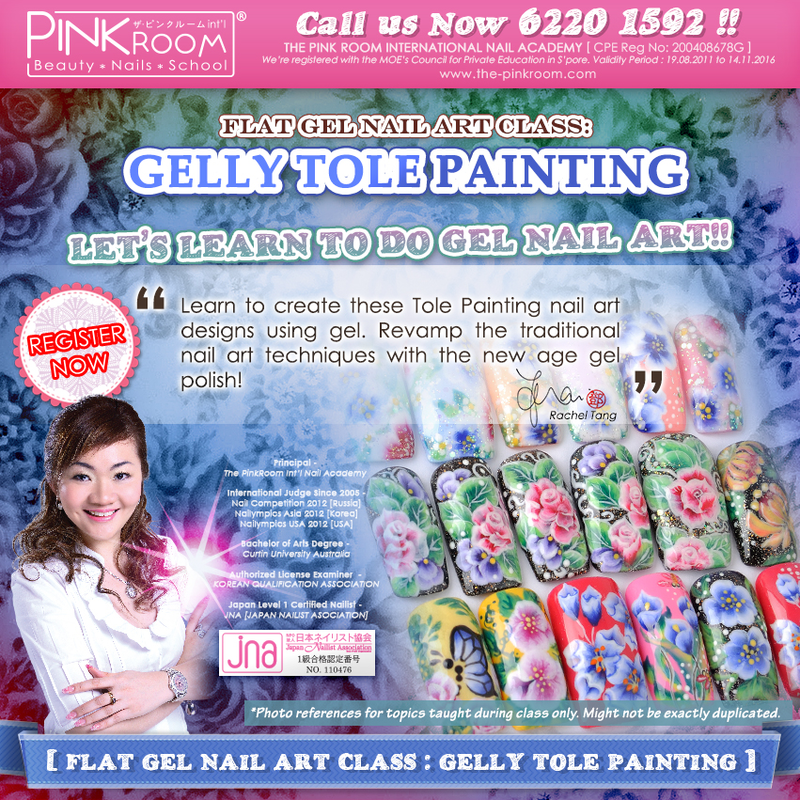 Gelly tole painting gives of a realistic and 3d nail art effects on your nails. As much as the traditional nail art painting is beautiful, this gelly tole painting is a unique way to change up your usual nail art styles. Barbie Lace II, a step-up from Barbie Lace I workshop. Featuring even more fanciful designs & intricate techniques to beautify your nails with an extra touch of allure!! Gel nails gives you longer period of flawless wear. Especially when you have drawn complicated designs and want them to last longer! Here is your opportunity to learn from Rachel. Catch her now before she zooms off for another overseas trip for judging/trainings! Grab your slots now as we are filling them fast. Hope this post has filled you in with more information on the different types of workshops we offer. We also offer Diploma & Professional classes if you are looking at obtaining a certificate for the nail art profession you wish to pursue! Feel free to check them out and if you have any enquiries, you can contact us at 6220 1592. Our dear Principal Rachel Tang invited Ms Eriko Kurosaki for a one-day Japanese Nail Art Class with Eriko Kurosaki. It was a rare experience for our students as Eriko-sensei seldom conduct classes out of Japan. This time, she was in Singapore to celebrate PinkRoom’s 10th anniversary with us! Apart from the class, Eriko-sensei was one of the judges for the Pink Room Cup Nail Competition. It was our great honour to have Eriko-sensei in Singapore. She is a popular nail celebrity in Japan, who has her own nail schools in different part of Japan. Come meet Ms Eriko Kurosaki in SINGAPORE! Ms Eriko Kurosaki is world-renowned and award-winning Japanese Celebrity Nail Artist, and the only japanese nail artist to have won first place in World Championships! She was one of the first to spearhead into the nails industry, and is renowned for as the World Champion Instructor! Don’t miss the chance to learn the secret and authentic japanese nail techniques! ONLY $280! Without having to pay for accommodation and flight, you get to learn what you will be learning if you travel to Japan for Ms Eriko’s Class! Nail Guru Rachel Tang, Founder of Pink Room. First come first serve, limited seats per class. In case you’re wondering, The PinkRoom International Nail Academy not only provide workships to coach our students on unique nail art techniques, we also do corporate workshop programmes! Awhile ago we had a corporate workshop for the Singapore Association of Administration Professionals (SAAP). These lovely ladies spent their afternoon with us for a beginner’s gel nail art and had fun practicing the designs on their own nails! If you would like to organize a corporate workshop for your company/association, please feel free to give us a ring at 6220 1592 or email enquiry@the-pinkroom.com for more information! We’re super excited to finally announce our upcoming exclusive 2-DAY AIRGEL BASIC COURSE with Ms. Noriko Naito, world-renowned nail educator and airbrush expert. While airbrushing has been around for awhile, airbrushing with Gel is an entirely new technology. Bring your skills to the next level by learning how to create the perfect masking and gradient designs with Gel using an Airbrush Machine. Start off airbrushing by learning from the best – Ms Noriko Naitoh is a veteran in the nail industry with over 20 years of experience. She is the founder and principle of her eponymous Nail College in Japan and an authorized trainer at the Japan Nail Association (JNA), the largest and most respected nail association in Japan. Over the years, she has won multiple nail competitions and has mentored many other nail champions as well. In 2013, Ms Naitoh authored and published a book on hand-painted and airbrushed nail art, which is being distributed internationally. The workshop will include step-by-step hands-on learning, in-depth demonstrations, a wide range of airbrush nail art designs and a complete product kit containing everything you need to get started. For more information or to register, simply reply to this email or call us at +65 6220 1592. Limited seats are available so do not miss this opportunity! Freaky Friday! Let Kitty spook you this Halloween season together with our Nail Guru Rachel Tang. Gather your ghostly friends to PinkRoom! Nails is another important component in your halloween dressing. You can neutralise your scary looks with a set of cute kitty nails. Halloween does not always have to be scary! Offer your customers with more variety as you pick up some of the kawaii nail art that hails from Japan! And we all know that Japan is home to all things sweet, adorable and intriguing. So do not miss this chance to master the Art of Cuteness Overload with Nail Guru Rachel Tang (iamracheltang), Founder of Pink Room. Stay on top of the game with Pink Room’s Kawaii Basket Workshop that will be conducted by Ms. Rachel Tang (iamracheltang), Founder and Chief Educator of The Pink Room, this June! With years of experience in the nail industry, traveling and mingling extensively overseas, Rachel regularly picks up foreign skills and aim to introduce them into the local market. Allowing our students to be the leaders of nail art trends. Coming up, Pink Room’s Kawaii Basket Workshop will be all about Japan’s most well-kept secret techniques on crafting adorable nail art that will win your customers’ hearts! Nail art taught are what nail salon-goers are always on a look out for! Let your salon stand out from the crowd. For more details, please call 62201592. First come first serve, Limited seats only.